For a GARLIC 'N ROASTED RED PEPPER SPREAD, combine 1/2 cup Hellmann's® or Best Foods® Real or Light Mayonnaise, 1 jar (7 oz.) roasted red peppers, drained and finely chopped, 1/2 tsp. red wine vinegar and 1 clove finely chopped garlic. For a WASABI SPREAD, combine 1/2 cup Hellmann's® or Best Foods® Real or Light Mayonnaise,  3 Tbsp. prepared wasabi and 1 Tbsp. EACH lime juice and chopped cilantro. For a BLUE CHEESE 'N BACON SPREAD, combine 1/2 cup Hellmann's® or Best Foods® Real or Light Mayonnaise, 1/4 cup crumbled blue cheese and 2 slices crisp-cooked crumbled bacon. Great on roast beef sandwiches and burgers. For a BUFFALO SPREAD, combine 1/2 cup Hellmann's® or Best Foods® Real or Light Mayonnaise, 1 Tbsp. cayenne pepper sauce and 1 Tbsp. chopped parsley. 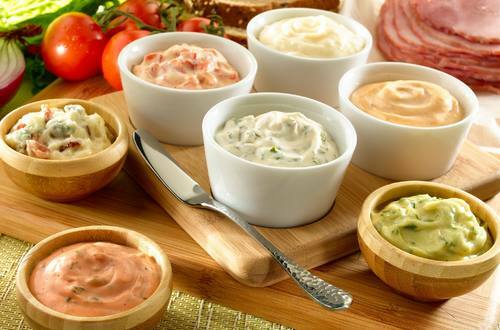 For a FRESH ITALIAN HERB SPREAD, combine 1/2 cup Hellmann's® or Best Foods® Real or Light Mayonnaise, 1 Tbsp. EACH chopped basil and oregano and red wine vinegar and 1 clove finely chopped garlic. For a SMOKEY CHIPOTLE SPREAD, combine 1/2 cup Hellmann's® or Best Foods® Real or Light Mayonnaise,  1 clove finely chopped garlic, 1 Tbsp. lime juice and 1/2 tsp. chipotle pepper.